Spring Tree Care Checklist from Tree Pruning to Planting - Crowe Tree Service Inc.
Winter is on its way out as spring kicks off to spark the change in seasons. This is the time of year to start focusing on spring tree care for your home. Your main task right now is to prepare your trees for new growth as the snow and ice melt away. Additionally, if you want to plant new trees then now is the time to start planning for them. Follow this checklist for things that need to be done in spring. This time of year is the perfect time to get your trees inspected. It is easier for arborists to identify disease and any winter damage that may be impacting your tree growth. Spring is also the perfect time for tree pruning which will help encourage spring growth. This is the process of trimming dead and damaged branches as well as cutting off any unsafe branches to prevent injury. The best time for tree pruning is early spring because if you have your trees pruned after spring then your tress can be attacked by various diseases and insects/pests. When tree pruning is done properly, you will have a huge positive impact on the overall health of your trees and their accelerated growth. 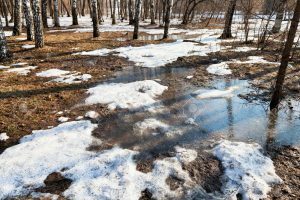 Once the snow and ice melt away, you will want to take this opportunity to clean your yard and remove branches, leaves and other types of waste that have been accumulating in your yard. This can allow sunlight to not just reach but also penetrate beneath the soil surface which can help with the development of tree roots, resulting in the most optimal spring tree growth. After the winter months, your soil is likely lacking the proper nutrients for your tree. Consequently, you should take advantage of the spring time and start your tree fertilization program so that the nutrients can be replenished in your soil which will help with the overall health of your tree and make your tree less vulnerable to pests and disease. Another way to improve the soil quality around your trees is to mulch. Tree mulching helps to keep your soil fertilized and moist which will also stop weeds from growing (added bonus) and mulching is very important for young or newly planted trees that you may have added this spring. Two to four inches is sufficient around your trees. There are many reasons people plant trees from pure aesthetics to the production of oxygen. Plants in your yard will also provide much needed shade during the summer months and offer a place to hide for your family and pets. Additionally, the newly planted trees will help increase the value of your home in time as people seek properties with a lot of tree coverage. While trees can be very beneficial, they must be planted in the right way and the first step is choosing the right place to plant them. This is where we can step in with our tree planting services to offer the best recommendations and tree planting for successful tree growth. Crowe Tree Service offers a full range of spring tree care services in Ottawa and our professional arborists are always happy to help you with all of your tree care needs from tree removal, tree pruning, tree care and hedge trimming. Contact us today to get free consultation on your tree care services this spring and get a jump start on the season.